I'm sure LeBron will look totally badass when this footage is crisply edited and set to a Jay Z song, but right now we can enjoy the contextless hilarity that is LeBron James flipping tires and roaring at a dude with a bandana tied around his face. OK, Chris Bosh. Very cool. Nice dribbling. Maybe Dwyane Wade can help us out? 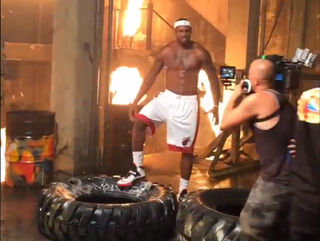 Man, everyone besides LeBron appears to be having a terrible time at this video shoot. Maybe the other guys can get a turn on the rope thingies? Everyone looks cool and tough while whipping those bad boys around.